The Live with Walkman offers a 5 megapixel snapper with a single LED flash. There is a handy dedicated shutter key too just like on the Xperia active and the Xperia mini. The user interface of the Live with Walkman's camera is quite intuitive. You have a bar with five shortcuts to popular features on the right, a bar with the latest captured images on the left and still camera/camcorder switch at the bottom. You can hide or expand both bars with swiping gestures. The five most used shortcuts allow you to change the capturing mode, resolution, to pick a scene, turn on flash and switch to the front-facing camera. Upon pressing the menu key (or dragging the left bar to the right side) you get some extra customizable options like focus mode, touch capture, white balance, geo tagging and image stabilization. The Live with Walkman also boasts face detection and smile shot. Image quality is decent on the Live with Walkman. The produces photos have good color reproduction but the amount of captured detail isn't impressive. Detail gets smeared the further away from the center of the picture you look. Noise is very low but due to the agressive noise reduction algorithm much of the detail is lost. We took some close-ups of flowers while out with the Live with Walkman. The results aren't too impressive. The phone oversaturates the colors to the point where you can't tell the petals apart. Finally, here's a panorama shot made with the Live with Walkman. Using the propriety camera option you can shoot panoramas by moving the device while it takes the pictures - this is called Sweep Panorama. Here is the result of one of our attemprs. 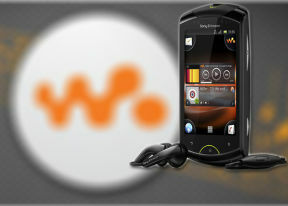 We’ve also added the Sony Ericsson Live with Walkman to the database of our Photo Compare Tool. The Tool’s page has a quick how to guide and also what to look for. You can clearly see from the comparison tool that the shots are pretty much identical with mini pro and the mini's samples and fall behind other 5 megapixel snappers. HD video recording is turning as a hot feature recently and the Live with Walkman is doing relatively well with the framerate. It’s 30fps and quite steady too. As some previous Sony Ericsson devices, the Live also captures few duplicated frames, but not that much to ruin the video. The Live with Walkman camcorder supports continuous autofocus. Its approach is the same as on the Xperia X10, Arc, Neo, etc: it may take a few seconds to refocus after you reframe instead of fast and constant re-focusing. It’s certainly the approach we prefer. Quite expectedly, the video quality is on par with the mini pro. The videos run smooth, but the captured detail is low and there's a pinkish spot in the center. On the positive side, the color rendering is spot on. The HD samples look good on the small display, but they are not that great on a bigger screen. The best we can say for the quality of the 720p videos capture with the Live with Walkman is that they are smooth. Detail is very low and the elements in the video look soft focused and not sharp. Check out the untouched 720p sample that we captured with the Live with Walkman. We added the Live with Walkman samples to our Video Compare Tool database too and put it head to head with the other 720p mobile camcorders we have tested. The lack of fine detail is evident when compared to competing products plus there's a pinkish spot in the center of the frame, although it's not that intrusive as it was on the mini pro.